This compilation, edited by Laurel Ann Nattress (of Jane Austen blog, AustenProse, fame), was a complete surprise to me. I was unsure of what I was expecting, but picked the paperback up regardless for (AU)$21.95 from Dymocks in Castle Towers, Castle Hill ISBN: 978-0345524966. As someone who generally does not read short stories, I found some beautiful gems within this 464-page anthology – and many of them had a Pride and Prejudice slant. 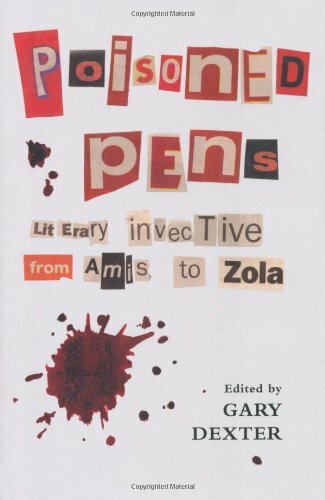 Browsing in Basement Books on my way home from UTS yesterday, I came across “Poisoned Pens” edited by Gary Dexter, “Literary invective from Amis to Zola”. It was AU$7.95 (original price AU$24.95) for the hardback, and the quote in the dust jacket sealed the deal. If you’re really keen to have a read though, the entire thing is on Google Books here for you to peruse (especially have a read of the introduction) – and you can do a quick search for Jane Austen to see all the snippets I will be discussing below. “Every time I read Pride and Prejudice I want to dig her up and hit her over the head with her own shin bone” -Mark Twain on Jane Austen, it read. Amusing, giggle-worthy words and I decided to buy the book for hopes of more Austen tidbits.